A Raja was out hunting in the forest. He spotted a deer and as he was pursuing it, he went too far and discovered that his retinue had been left behind. He lost his way and was overcome by hunger and thirst. At last, he saw a tiny hut where lived a poor woodcutter and his wife who sold fuel in the distant village. Their larder was almost empty, but the wife managed to prepare a roti which the Raja ate with great relish. He had never known such taste, for he was never so hungry as then. And he slept soundly that noon, for he had never been so tired at any time before. By that time, the courtiers and soldiers came up to where he was and the astounded woodcutter learnt that his guest was no less a person than the monarch of the realm. He apologised for the poor fare he had offered, though the king had never uttered a harsh word. Next day, some men came from the capital to take him to the king’s court and the poor man felt certain that he was going to be punished for not taking proper care of the ruler. 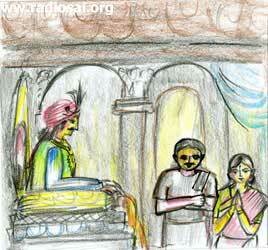 His wife accompanied him as she offered to share the fate of her lord. The Raja gave him a seat and insisted upon his sitting, an honour which the woodcutter knew, was usually given to animals that were about to be sacrificed. He and his wife were fed sumptuously, another honour which such animals usually get. Then the Raja asked him what boon he would ask from him and the terrified man could ask for only this, “Please allow me to go home alive with my wife! Please do not cut off my head,” he cried. 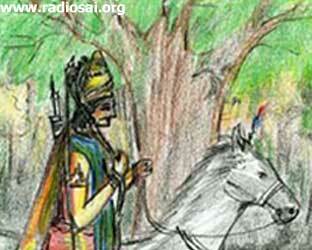 The Raja said, “I am not an ungrateful wretch to treat you so cruelly. If I give you an estate you will ruin it, for you are unaware of agriculture. If I give riches, thieves will carry it away, for you live alone in the jungle. Well, I am giving you a sandalwood plantation in that forest, thirty acres in extent. Make good use of it and prosper.” The woodcutter felt relieved and he went happily back to his home in the woods. After about six months, the Raja went to the forest again for a hunt and remembering the roti, he went in search of the woodcutter. He found him quite happy but was disappointed when the woodcutter told him that he had started selling charcoal instead of fuel! The sandalwood trees were being burnt and reduced to charcoal by that man because he did not know the value of the gift he had received. So too, man does not realise the value of the precious gift of “the number of days” of life he has received from the Lord. He fritters them away acquiring ephemeral objects and fleeting pleasures, that makes his life invariably a tragedy instead of a happy pilgrimage towards God.